Founded in 2015 by Richard Olsen, Lykke is a Swiss-based company building a global marketplace for the free exchange of financial assets. The mission of the company is to democratize finance by leveraging the power of the blockchain. More than 60 cryptocurrencies accepted, including Bitcoin (BTC), Bitcoin Cash (BCH), Ethereum (ETH), Litecoin (LTC) and Dash (DASH). Afghanistan, British Columbia, Quebec and Saskatchewan provinces in Canada, Democratic People's Republic of Korea, Iran, Japan, New Zealand, Syria, Yemen and USA. With its main headquarters in Zug, Switzerland, Lykke is a semi-decentralized exchange for both cryptocurrencies and fiat founded in 2015 by Richard Olsen, probably one of the most influential people in the Forex industry, as he’s the founder of Oanda, one of the very first fully automated FX trading platforms. Mr. Olsen is also a very respected academic researcher in the field of high frequency finance, with more than 70 publications on this matter. With such credentials, we should expect that Lykke is somehow a different cryptoexchange. And, as we will soon find out, there are several features which confirm that this is indeed the case. What makes Lykke different? Lykke is more than an exchange, as it offers its own wallet (Lykke Wallet), crypto and fiat trading in Lykke Trade and the possibility to invest in cryptocurrency dynamic portfolios (LyCI, Smart LyCI, Pay LyCI) using its proprietary LyCI Service Token. Focusing on trading at the Lykke exchange, the trading platform interface which is accessible using your web browser or the Lykke app for iOS and Android, is simple yet effective: it has the most common order types (Market, Limit) to quickly buy and sell cryptos. 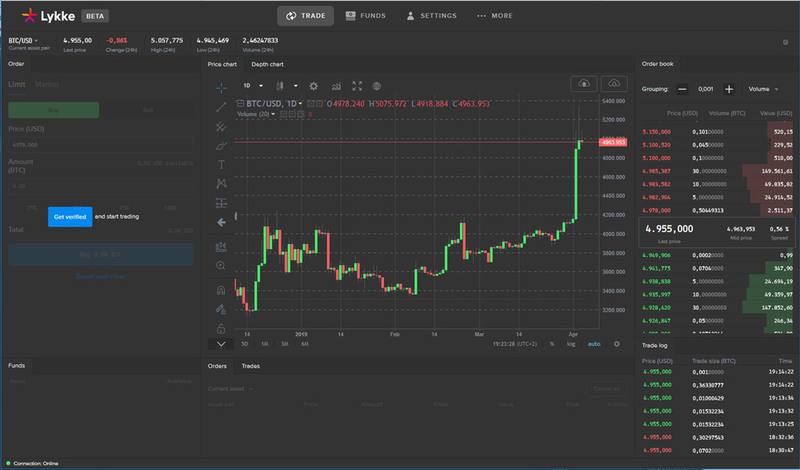 Regarding price charts, they are based on the TradingView API, so you can be sure that you will have access to the most commonly used trading tools and oscillators, although in this case you can’t save your own templates. What it has caught my attention after testing Lykke’s trading platform is the huge list of cryptocurrencies available for trading. Also traditional fiat currencies and digital assets like Gold, Silver, Palladium or Platinum can be traded. Therefore, you can easily trade BTC against ETH at Lykke but you can also sell the Euro versus the Yen or buy some Gold. And the best news is that Lykke trading fees are... well, there aren’t any trading fees at all!!! That is, you pay 0% per transaction so if you’re an active cryptotrader you will surely benefit from this. Also there is an interesting token in the list of tradable assets: LKK or Lykke Coin, which is the native token of the Lykke exchange. You can also find the same ticker ending in 1Y or 2Y, which means it’s a 1-year or 2-years forward contract, that is, a derivative product which expires in a given period; for example, LKK2Y is an ERC20-based token that confers the right of the holder to receive the base value of the token, expressed in Lykke coins (LKK) two years later. This is the kind of things where you can feel Mr. Olsen’s distinct touch, merging a traditional derivative product with cryptocurrencies. Our bet is that probably the next Lykke move will be introducing forward contracts for other cryptocurrencies in the near future. The only drawback I’ve found while testing the trading platform is that probably there’s not too much liquidity at this moment, and the spreads are above the average, so sorry crypto scalpers but this is not your exchange. Anyway, this is something that it will improve in the next months as Lykke’s traded volumes start growing. 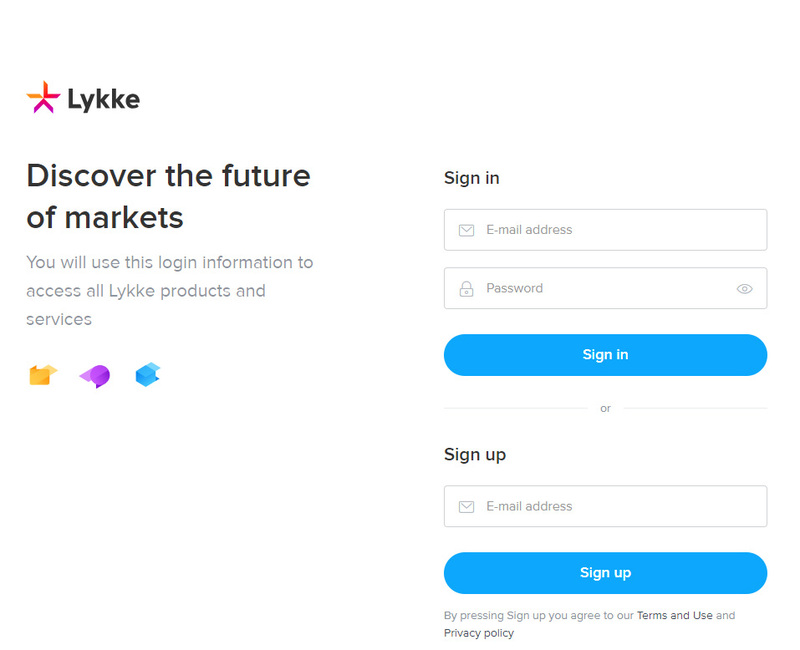 The process of opening an account at Lykke is very simple: just enter your email address in the Sign up field, verify it and provide some basic information. After that you will be able to deposit Bitcoins as well as Colored Coins, which are the digital equivalent of a real assets and are always connected to the offerer and covered by the underlying asset. In case you want to deposit fiat currency, you will have to go through the usual KYC and verification process. Lykke accepts cryptocurrency deposits, as well as via credit cards and wire transfers (only USD, EUR, GBP and CHF). There are no fees for cryptocurrency deposits though that’s not the case for crypto withdrawals operations. In the case of credit cards, a 3.9% transaction fee applies, while withdrawals are not allowed. Also bear in mind that some restrictions may apply to the size and number of daily transactions when it comes to credit cards. Finally, there are no fees for wire transfer deposits or withdrawals, but the minimum amount you can deposit or withdraw is 50 USD/EUR/GBP/CHF, while the maximum is set at 1,000,000 USD (or equivalent in other currencies). In any case, you can find up to date information regarding these fees here. Lykke uses 2-of-2 Multi-Signature address wallets to deposit trader’s coins, which means that two signatures are required to spend coins from it -both trader’s and exchange’s signatures. In case the exchange's private key is lost or destroyed, Lykke also provides a mechanism of offchain refund transactions in order to guarantee funds recovery from the Multi-Signature wallet. Also there’s the possibility to set up a private wallet to store your crypto assets so you can have them separated from the exchange funds. Lykke could be considered as an early stage of a very promising project in the cryptocurrencies landscape. The broad experience and reputation of Richard Olsen in the Forex industry is definitely a guarantee of quality for Lykke. This can be clearly seen in innovations such as the possibility to have a private wallet, the chance to invest in crypto portfolios that track the best cryptocurrencies used to buy and sell goods and services or to set up smart contracts, or the introduction of forward contracts using Lykke’s token. Also the main company is based in Switzerland which is a good sign of quality and ensures that our cryptoassets will be safe. Lykke provides a wide selection of cryptocurrencies to trade, together with the possibility of trading fiat currencies as well as some precious metals in its digital version. This definitely makes a difference compared to other exchanges. If we had to find a weak spot in Lykke, that it’s the low level of liquidity which has a negative impact on its above the average spreads, so, probably, this is not the best exchange for active traders. Hopefully this is something that is easy to fix in the short term. By the way, in case you’re interested Lykke is currently running an interesting promo: once you have opened your account and completed the KYC verification process, if you deposit at least 100 USD (or equivalent amount of units in other currencies), you will receive a gift of 10 USD. The campaign is valid until 30th of May 2019. Submit your details below and register your new accountin lykke.com. (The submitted details should match with the details of your new Lykke account). Complete the KYC verification process. Deposit at least 100 USD or equivalent amount of units in CHF, EUR or GBP and you will receive a gift of 10 USD. This campaign is valid till 30th of May 2019. All sign ups and KYC submissions should be approved before the end of the campaign. The 10 USD gift is claimable only once.